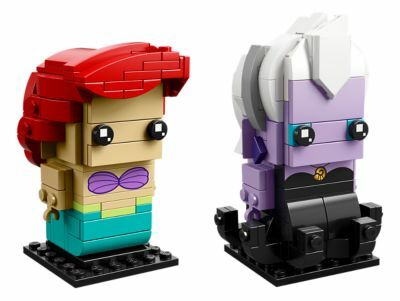 These LEGO® BrickHeadz™ construction characters featuring Ariel and Ursula are fun to build using LEGO bricks that recreate all their iconic details from Disney’s The Little Mermaid movie, including Ariel’s flowing red hair, green tail and seashell bikini top, and Ursula's tentacles. They also stand on buildable collector's baseplates for easy display in your home, office or any ocean you like. Price is 13% above the initial Lego retail price! This comes down to 6.37 cent per brick. The Ariel & Ursula (41623) Lego set is no longer directly available from the sites below. However, 3rd party partners of these sites might still have the set available. Alternate description Dive into underwater LEGO® BrickHeadz™ adventures with Disney’s Ariel and Ursula! Buildable Ariel and Ursula figures from LEGO® BrickHeadz™ feature decorated eyes and authentic details from Disney’s The Little Mermaid movie, including Ariel’s red hair, green tail and seashell bikini top, and Ursula’s tentacles. Have fun growing your LEGO® BrickHeadz™ collection with other characters from your favorite films, TV series, games and comics. Disney’s Ariel and Ursula characters stand over 2” (7cm) tall without baseplate. Baseplates measure over 1” (4cm) square.